Sustainable Development under Population Pressure: Lessons from Developed Land Consumption in the Conterminous U.S.
“Population growth will result in a significant anthropogenic environmental change worldwide through increases in developed land (DL) consumption. DL consumption is an important environmental and socioeconomic process affecting humans and ecosystems. Attention has been given to DL modeling inside highly populated cities. However, modeling DL consumption should expand to non-metropolitan areas where arguably the environmental consequences are more significant. Here, we study all counties within the conterminous U.S. and based on satellite-derived product (National Land Cover Dataset 2001) we calculate the associated DL for each county. By using county population data from the 2000 census we present a comparative study on DL consumption and we propose a model linking population with expected DL consumption. County relative DL consumption ranking contrasted with 100 counties of similar population. Twenty-two GISCorps volunteers responded to the call for Typhoon Pam, which devastated the island nation of Vanuatu on March 13, 2015. The Digital Humanitarian Network was activated by the UN Office for the Coordination of Humanitarian Affairs (UNOCHA) and member organizations formed interdisciplinary teams to quickly monitor, process, and analyze incoming information from social media. GISCorps partnered with Humanity Road and PeaceGeeks to provide spatial context to social media input, resulting in data and maps to share with the humanitarian community. The GISCorps team was led by Heather Milton, with additional coordination and technical support from Carol Kraemer and David Litke in the five-day around-the-clock online operation. Volunteers assisted with geo-locating needed information and creating the maps. The GISCorps team utilized Skype, Google Apps, and ArcGIS Online for the effort. Donate to URISA’s GISCorps to support the program’s mission. This program runs entirely on volunteer time and monetary donations. Note that donations are tax-deductible in the U.S. If you want to volunteer with GISCorps, fill out a Volunteer Application Form. If you need services from GISCorps, fill out a Project Application Form. “Protected areas (PAs) are key for conserving rainforest species, but many PAs are becoming increasingly isolated within agricultural landscapes, which may have detrimental consequences for the forest biota they contain. We examined the vulnerability of PA networks to climate change by examining connectivity of PAs along elevation gradients. We used the PA network on Borneo as a model system, and examined changes in the spatial distribution of climate conditions in future. A large proportion of PAs will not contain analogous climates in future (based on temperature projections for 2061–2080), potentially requiring organisms to move to cooler PAs at higher elevation, if they are to track climate changes. Map of Borneo showing location of refuge (n = 30) and source PAs (n = 210). Source PAs are shaded according to the minimum dispersal ability required for individuals to successfully reach target PAs (assuming 100% forest cover in PAs, a population density of 125 individuals per 250 m forest grid cell and using RCP8.5 temperature projections). “Geoscience observations and model simulations are generating vast amounts of multi-dimensional data. Effectively analyzing these data are essential for geoscience studies. However, the tasks are challenging for geoscientists because processing the massive amount of data is both computing and data intensive in that data analytics requires complex procedures and multiple tools. To tackle these challenges, a scientific workflow framework is proposed for big geoscience data analytics. In this framework techniques are proposed by leveraging cloud computing, MapReduce, and Service Oriented Architecture (SOA). “The continuous growth in fish consumption and related activities is stressing the fishing industry worldwide. To counteract this, mariculture might represent an opportunity for consumers, industry and marine resource sustainability, as long as careful site selection is taken into consideration. The current study was developed to assess potential sites for the implementation of marine fish-cage industries on the Azores Archipelago (North Atlantic), through the application of a multi-criteria approach based on geographic information. Descriptors that may have either direct or indirect influences on the development of mariculture activity in the Azores were discriminated into factors and constraints and grouped into environmental, socioeconomic, and administrative categories. The Science Organization Site License is designed to deliver easy access to the full suite of GIS technology to researchers. As entities of universities or as standalone organizations, researchers at a small non-commercial, science organizations or research institutes are unique in that they not only conduct research, but may also coordinate diverse sectors (government agencies, NGOs, small businesses, etc. ), build consensus among experts, and pay special attention to GIS project implementation, tool development, and technology transfer. These science organizations are typically much smaller than a university (e.g., 50 to 500 employees). In terms of licensing of Esri technology, these science organizations may fall through the cracks (i.e., they may not be affiliated with a university, not truly a government agency, not truly a conservation or humanitarian non-profit, and if part of a university, may be located off-campus and thus have difficulties getting resources or recognition from the broader campus university site license). The science kit, a US domestic offering, designed to meet their unique needs. Researchers at such organizations are typically equivalent to faculty members at a college or university, but not engaged in nearly as much teaching–or perhaps no teaching at all. Their focus is more along the lines of data collection, analysis, interpretation, and publishing of research results in the areas of geography, ocean science, hydrology, ecology, forestry, climate science, geology/geophysics, agricultural science, conservation biology, geographic information science, computer science, sustainability science and/or geodesign. These researchers may be skilled in GIS and computer programming, or rely on the support of GIS analysts or information systems managers at their organization. The Esri Science Organization Site License is designed to deliver easy access to the full suite of GIS technology to researchers. ArcGIS Online is a key offering within the kit so that it may be used as an organizational platform for research, as the infrastructure to perform that research, and as a digital science information laboratory. The Esri Science Kit is aimed at fostering science collaboration, visualization, analytics, modeling, communication, and in building a complete science data management system. Therefore, if a research grant is forthcoming to the organization, this is the magic ingredient to use. “Load your own data and go,” with Esri basemaps, story maps, ArcGIS Collector, sharing/collaboration space with an ArcGIS Online for Organizations account. The science kit includes the ArcGIS Open Data app as part of the organizational account as another option for easy and open sharing of data (e.g., drag and drop maps, tables, shapefiles into the app to share on the web, open for developers, open for science communicators). At the scale of supporting inter-organization collaboration from research institute to research institute, research institute to federal agency (e.g., NOAA/NASA); research institute to national or global initiative such as NSF EarthCube or GEOSS. At the scale of broader citizen engagement, in communicating its science to the general public (e.g., story maps and open web map publishing). 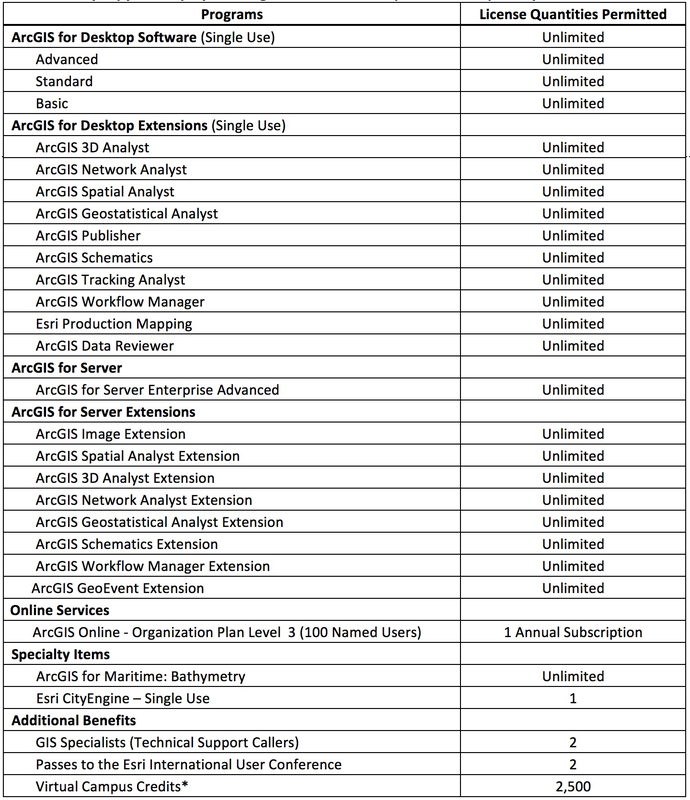 The list above is subject to change should Esri commitments to third parties regarding licensed third-party technology included in Esri products prohibit or not provide redistribution rights in Site licenses to Esri licensees. Uncapped use of products as defined in the Deliverables section – unless otherwise noted. Esri Press has authorized the gift of two science related Esri Press Books to the Esri Science Organization Site License customers. The choice of the books will be up to Dawn Wright and the customer. Technical Support Services: Technical support services are included and will be provided in accordance with the then-current Esri technical support policy, provided Licensee remains current on its payment of the Annual Fee. Licensee’s GIS Specialist(s) will be the only individual(s) authorized to contact Esri for technical support. Upgrades: During the general commercial release of the Products, Esri, at its sole discretion, will deliver to Licensee one (1) upgrade package for each of the Programs included in the Site License or make updates available for downloading from Esri’s website, provided the Annual Fee has been paid and the Agreement is current. Dawn Wright, Esri Chief Scientist, dwright@esri.com.